Director/producer Ron Howard and producer Brian Grazer have cast an energetic company of some of the world’s most talented and interesting rising international stars to join Tom Hanks in Inferno, the new film in Columbia Pictures’ Robert Langdon series, which has taken in more than $1.2 billion worldwide to date. The Imagine Entertainment production, which has a screenplay by David Koepp based on the book by Dan Brown, is slated for release on October 14, 2016 and will begin principal photography at the end of April. The project’s executive producers are Dan Brown, Anna Culp, Bill Connor, and David Householter. Felicity Jones, an Oscar® nominee this year for her performance in The Theory of Everything, will star opposite Hanks as Dr. Sienna Brooks. Irrfan Khan, one of India’s biggest stars, best known for his roles in Slumdog Millionaire, Life of Pi, and The Lunchbox, takes the role of Harry Sims, also known as The Provost. French actor Omar Sy, best known for his work in the French mega-hit The Intouchables, as well as X-Men: Days of Future Past, the upcoming Jurassic World, and John Wells’ upcoming untitled project, will play Christoph Bruder. Sidse Babett Knudsen, star of the Danish television series “Borgen,” will portray Dr. Elizabeth Sinskey, the head of the World Health Organization. The filmmakers are also in talks with several other internationally recognized actors for major roles. Michael De Luca and Andrea Giannetti will oversee the project for Columbia Pictures. This week on The Good The Bad The Ugly Film Show Adam, Dave, Nick and Greg take a look at new release films ‘The Lunchbox’, ‘All This Mayhem’ and ‘The Dawn Of The Planet Of The Apes’. This episode also contains interviews with Fred Schepisi, Jay Dub and Genevieve Kelly. Greg also takes an in-depth look at the Scandinavian Film Festival. Also listen for your chance to win a copy of Nymphomaniac Vol 1 + 2 on DVD thanks to Icon Distribution. 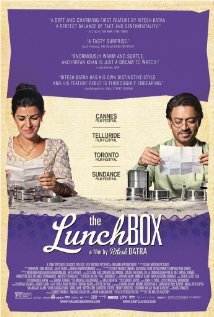 Summary: Set in modern day Mumbai amongst the city’s famously efficient lunchbox delivery system, Saajan (Khan) accidentally receives a meal intended for the husband of the unhappily married Ila (Nimrat Kaur). Eventually discovering the delivery man’s accident, Saajan and Ila start to secretly correspond, noting observations of the busy world around them before their letters become more personal. A quick thought of Indian cinema often conjures up blatant rip offs of Hollywood blockbuster and of course the all-singing and all-dancing dazzle of Bollywood. For some reason the more serious kinds of cinema, which surprisingly is a category that The Lunchbox fits into, seem to go missing and never find their ways into cinemas around the world. Luckily though someone has seen fit to give The Lunchbox a go at box office success outside of its native India. This succulent film tells tThe tale of two very different people who live two very different lives in modern Mumbai. Ila (Nimrat Kaur) is an unhappy housewife whose main job each day is to prepare her husband’s lunch and make sure it is given to the local dabbawallah to deliver to his work. Meanwhile widower Saajan Fernandes (Irrfan Khan) is seeing out his days at a mundane office job while those around him are preparing for his impending retirement. The fact that he suddenly accidentally starts receiving Ila’s food sparks a new romance for him, while training his replacement Shaikh (Nawazuddin Siddiqui) gives him new life in the office. Surprisingly this is director/screenwriter Ritesh Batra’s first feature film. Unlike so many first time directors he doesn’t fall into the trap of trying to recreate the styles or storylines that have made films popular in the past. Batra really brings his own style to The Lunchbox. He doesn’t make the mistake of deciding that this should be a laugh-out-loud romantic comedy like most Hollywood directors would have made this film. It is however that style of filmmaking that will either make audience members love this film or loathe it. Some will see The Lunchbox as a good move away from the Hollywood style of romance. Batra concentrates on this being a slow moving character piece. He doesn’t need to show a confronting scene to show that Ila is an emotionally abusive relationship, it’s a slow burn trip through a number of days in a row to show just how dull her life is. Likewise Batra doesn’t need to inject outrageous Adam Sandler like comedy into the film to get a laugh; no he can just allow some natural laughs to come from the seemingly odd-couple friendship that develops between Saajan and Shaikh. And just to throw absolute caution into the wind Batra even steers away from the conventional romantic ending that the romance genre has led its audience to expect, no here the audience will have to do some thinking of their own to work out what exactly happened. Of course having said that though there is a flipside to that coin. At times The Lunchbox is a little sickly sweet and a little too slow moving. This is not the kind of film that your regular popcorn cinema set audience member is quickly going to warm to. Not all film fans will enjoy the slow journey that Batra takes them on while others will savour the fact that Barta captures the essence of living in modern Mumbai, and its tasty cuisine, and puts it up on the big screen for all to see. The Lunchbox is made even better by the brilliant acting performance of Irrfan Khan. Khan’s acting career has had a real resurgence over the past few years. From becoming the first Indian actor to star in two Oscar winning films – with Slumdog Millionaire and Life Of Pi – to appearing in big Hollywood blockbusters like The Amazing Spider-Man and the forthcoming Jurassic World Khan has shown that he is an actor of substance who can cope with any role thrown at him. Here Khan hammers that point home with a dramatic yet quite performance that has the audience completely falling in love with character and hoping that he can again find romance in his life. Khan is well supported by Nawazuddin Siddiqui who manages to mix comedic timing with some serious acting as he plays the slightly odd Shaikh while Nimrat Kaur simply breezes through her role as she plays the likable Ila. The Lunchbox certainly is a slow burn but it is well worth the effort to sit through it. Technically it is a much better romance to a film like The Notebook. Yes the fact it is from the sub-continent will worry some cinema goers away from the film but if you loved films like The Exotic Marigold Hotel then this is one film that you will savor. Certainly this is one film that does manage to bring a country’s cuisine to the screen and that is something that the French film industry is going to loathe The Lunchbox for. Brisbane Lord Mayor Graham Quirk today announced that three Australian films, Mystery Road, anthology film The Turning, and Tracks, have received nominations across three major categories for the 7th annual Asia Pacific Screen Awards (APSA), the region’s highest accolade in film. The Turning has been nominated in the leading category Best Feature Film, Mystery Road actor Aaron Pedersen is nominated for Best Performance by an Actor for his first feature film lead and internationally acclaimed cinematographer Mandy Walker ASC ACS is nominated for Achievement in Cinematography for Tracks, the first Australian nomination in this category in APSAs history. The nominations include a record number of films from more countries and areas than ever before, with 39 films from 21 Asia Pacific countries and areas nominated for the awards, many of which have Australian distribution confirmed. The Awards, supported by Brisbane City Council and managed by economic development board Brisbane Marketing in a unique collaboration with Paris-based UNESCO and FIAPF-International Federation of Film Producers Associations, recognise and promote cinematic excellence and cultural diversity of the world’s fastest growing film region: comprising 70 countries and areas, 4.5 billion people, and responsible for half of the world’s film output. The Turning, an adaptation of the novel by iconic West Australian author Tim Winton produced by Robert Connolly and Maggie Miles, will compete alongside Oscar® winner Asghar Farhadi’s The Past, Japanese auteur Hirokazu Kore-eda’s Cannes Jury Prize winner Like Father, Like Son, Cannes Un Certain Regard Grand Jury Prize winner Omar (Palestine), Bangladesh’s submission for the 86th Academy Awards® Television, and Sri Lankan auteur Prasanna Vithanage’s With You, Without You. Tracks, directed by John Curran, starring Mia Wasikowska and produced by Oscar® winning producers Emile Sherman and Iain Canning, is the inspirational true story of Robyn Davidson’s 2700km solo trek through the remote Australian desert to the Indian Ocean, aided only by her loyal dog Diggity, four unpredictable camels and, at intervals, charismatic National Geographic photographer Rick Smolan. Also competing for the Achievement in Cinematography award are cinematographers Ehab Assal (Omar, Palestine), Murat Aliyev (The Old Man, Kazakhstan), Lu Yue (Back to 1942, People’s Republic of China) and Rajeev Ravi (Monsoon Shootout, India, UK, Netherlands). In Mystery Road Aaron Pedersen plays an Indigenous detective who returns to his outback home to solve a brutal crime, with a performance The Hollywood Reporter called “superb”. In the Best Performance by an Actor category, Aaron Pedersen is competing against Korean superstar Lee Byung-hun for Masquerade (Republic of Korea), actor veteran Tatsuya Nakadai – who has appeared in more than 100 films over the last 59 years – for Japan’s Tragedy (Japan), and two other actors nominated for their first feature film leads, Yerbolat Toguzakov (The Old Man, Kazakhstan) and Adam Bakri for Omar (Palestine). Australian Producers Anna McLeish and Sarah Shaw of Warp Films, who produced Snowtown, are nominated for their film Shopping (New Zealand), in the category of Best Children’s Feature Film. Australian actor Peter O’Brien stars in the lead role of Kasper Almayer for Malaysian feature Almayer’s Folly (Hanyut), nominated for Best Screenplay for the film’s writer/director U-Wei Bin Hajisaari. The 2013 Asia Pacific Screen Awards ceremony will be held in Brisbane’s historic City Hall on Thursday 12 December at a glittering event, with nominees and industry luminaries in attendance. Nominees automatically become members of the APSA Academy, led by Academy President Jack Thompson AM PhD. The APSA Academy is a growing body of the region’s most influential names in film including past APSA Nominees, International Jury and Nominations Council members. Winners in the feature film categories will be determined by the 2013 APSA International Jury, headed by esteemed Indian screenwriter and director Shyam Benegal, who will lead a group of accomplished Jury members including Korean screenwriter and director Kim Tae-yong, “Queen of Sri Lankan Cinema” actress of stage and screen Hon Dr Malani Fonseka, Turkish actor Tamer Levent, Swiss director Christoph Schaub and Hong Kong producer Albert Lee. The International Jury can also, at its discretion, present a further prize; the Jury Grand Prize, for which nominated narrative feature films are eligible. Two additional major awards for outstanding achievement will be presented at the ceremony; The UNESCO Award for outstanding contribution to the promotion and preservation of cultural diversity through film and the FIAPF Award for Outstanding Achievement in Film which celebrates a film practitioner from the region whose career and actions contribute strongly to the development of the film industry. The APSA NETPAC Development Prize of US$10,000 will also be awarded to a first or second time feature filmmaker. This emerging talent prize is supported by APSA and the Griffith Film School, Griffith University. The Turning is currently in release through Madman films with an innovative special event release strategy and has recently surpassed $1million at the Australian Box Office. Mystery Road is currently in independent release through Dark Matter, and Tracks will be released on March 6, 2013 through Transmission Films. Shopping will be released via Madman. In 2013, an unprecedented number of nominated international films already have Australian distributors including Wong Kar Wai’s The Grandmaster (Roadshow Films), Like Father, Like Son (Rialto Entertainment), My Sweet Pepperland (Sharmill Films), and films already released in Australia – Back To 1942 (China Lion Entertainment) and Saudi Arabian feature Wadjda, which was released by Hopscotch Films earlier this year. Madman Entertainment films have received nominations in every category and are confirmed to release Singapore’s Ilo, Ilo, Asghar Farhadi’s The Past, Palestine’s Omar, New Zealand box office hit White Lies, India’s The Lunchbox produced by APSA 2012 Jury Grand Prize winner Anurag Kashyap, Hayao Miyazaki’s final film The Wind Rises and documentaries The Gatekeepers and The Act Of Killing, both currently in release.